As promised, I am sticking to my plan of introducing one spice at a time to My Spice Cupboard and heres one more – Coriander. Coriander (dhania) Seeds are the seeds of a mature cilantro plant. The tannish yellow globes are very light in weight and have a subtle citrus flavor. They are grown in Europe and in India too. 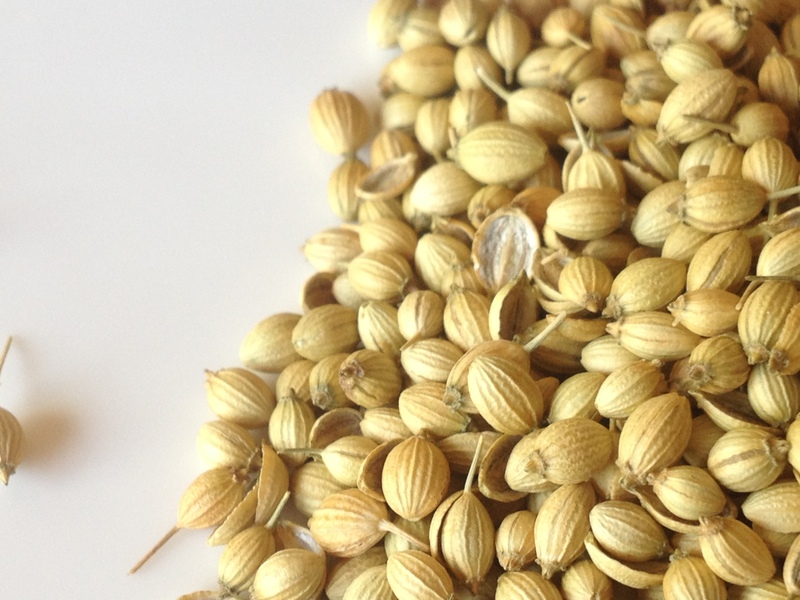 The coriander seeds grown in India tend to have a more of a citrusy flavor. When selecting them at the store, they should look pale yellow, not dull and dry. Coriander (dhania) Powder is made from ground up coriander seeds. 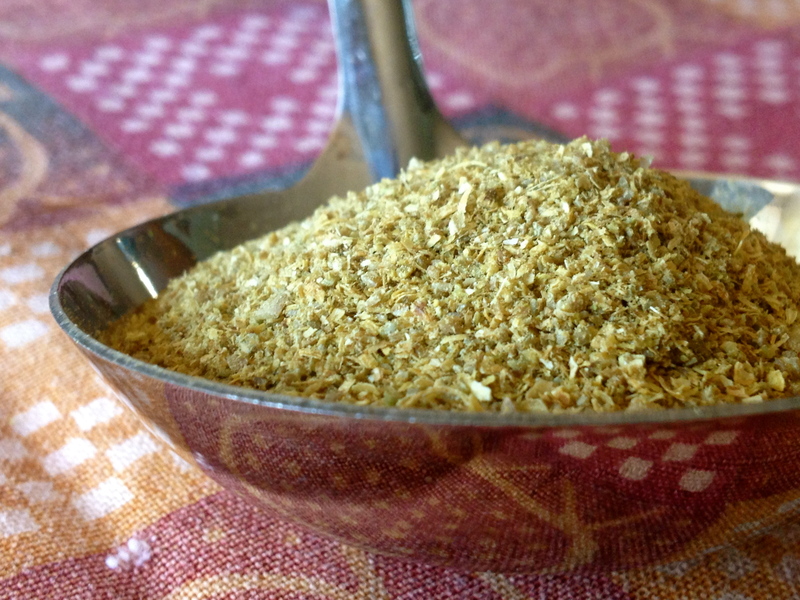 In comparison to the dark olive of cumin powder, coriander powder does look rather dry and ‘hay-yee’ in color. It has a rather loose texture and falls apart if pinched together. You can purchase the powder from the store, saves you the hassle of grinding it yourself, but it may have lost some of its flavor. I personally, prefer to dry roast the seeds a few cups at a time, till they are fragrant. This releases the essential oils. Wait for the seeds to cool down, before grinding them in a coffee grinder. I have a coffee grinder set aside for ‘spices only’. It doesn’t have to be a complicated machine. I love to do this, but I don’t do it as often as I should and that is grinding the spices with a stone mortar and pestle. The rhymic notes of the pestle moving in circular motions against the popping of the seeds and the grinding against the mortar is so soothing. A small fraction of time where I am at total peace. Yes, grinding the seeds this way is time consuming but so satisfying! Coriander and Cumin go hand-in-hand in several curry dishes. They compliment each other perfectly. Coriander is used commonly in powder form in Indian cooking. There are a few instances where the seeds are used whole. For instance, the coriander seeds are roughly crushed between the palms of the hand and mixed into ground meat, beef, lamb or chicken, intended for the grill. A common question when teaching a class on Indian Cooking is if coriander can be subsituted for cilantro and vice versa. Unfortunately not, even though they are from the same plant. So there you have it, another important component in Indian Cooking – Coriander. This entry was posted in Spices, Staples and tagged cilantro, citrus, coriander, coriander seeds, dhania, dhunia, indian cooking, marinade, masala, seeds, spice cupboard, spices. Bookmark the permalink. Love coriander…made your chicken curry recipe the other night and it was delicious! Bob thought so too! I love this concept of building a virtual spice cupboard! What a fun idea, and a lovely picture of the coriander pods. Freshly ground coriander is one of the most beautiful smells. I too have a ‘spices only coffee grinder’, but I love the mortar and pestle – you’re right, it is soothing! Definitely going to try your suggestion of dry-roasting spices before grinding them. Thanks for the tip! For as much as I think about and love cumin, I hardly ever think of coriander. But I can see it has the same warm flavor profile, though I’d usually think of it as I would cinnamon or other baking spices. Savory sounds good, too! Loving your photos per usual. Nice close up shot of coriander seeds! Coriander is the star ingredient of many curry bases. As it can thicken gravies, I use it lavishly. Love its taste and smell! I agree Coriander is a must, definitely! Thanks for letting me know as with cumin, coriander is a thickener too:) Thanks for having a look at my blog.